Paige M. R. Greene concentrates her practice on corporate matters. 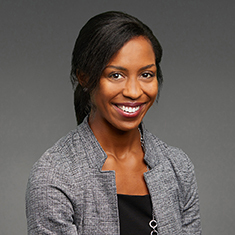 During law school, Paige served as primary editor of the Journal of Law & Policy, was president of the Women's Law Caucus, a board member of the Black Law Students' Association, a Career Development peer adviser and co-chair of the Dean's Student Advisory Council. Paige also completed an in-house externship at the Emerson Electric Company and was a student attorney for the Washington University School of Law Entrepreneurship & Intellectual Property Clinic where she received a high pass distinction for her work. Additionally, at graduation, Paige received the Dean's Leadership Award. Prior to law school, Paige was a litigation paralegal at a large law firm in Washington, DC. Shown below is a selection of Paige’s engagements.